With VeryPDF PDF Content Splitter, you can split a PDF files when come to page having different text, and also can split a PDF to multiple PDF files that every PDF file has the same text in the same given position. VeryPDF PDF Content Splitter is a helpful and grateful application which can split PDF file by the text content in given and specified position. With VeryPDF PDF Content Splitter, you can split a PDF to multiple PDF pages that have different text in the same specified position, and split a PDF to multiple PDF files that every PDF file has the same text in the same given position. a. 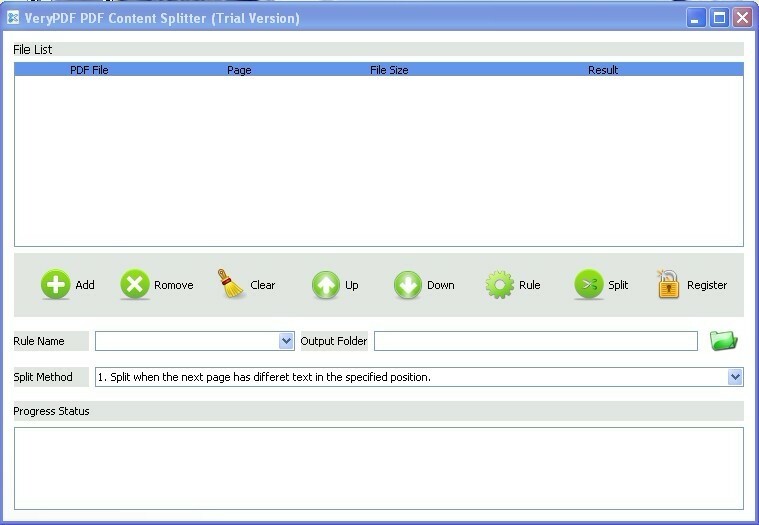 Split when come to page having different text: VeryPDF PDF Content Splitter can search and compare the text in the specified position of all pages of one PDF file. This feature is useful for splitting single-page documents like payroll, invoice, and order sheet. b. Group pages having the same text to one PDF: Besides splitting pages having different pages to different PDF files, it can also group these split pages having the same text in the given position. This feature is helpful for splitting and distributing PDF documents. For example, group pages having the same name and sending the document to the person of the name. c. Batch process: After saving a practical splitting rule, you can use the rule to split multiple PDF files in one batch with simple one click. This will save much of your time in doing monotonous repetitive work. 2. Support all versions of PDF. 4. Split pages having different text in the same specified to different PDF files. 5. Option to split when the next page has text in given position. 6. Split and then group pages having the same text in given position together. 7. Support saving multiple splitting rules. 8. Batch process: It can deal with multiple PDF files in one operation. Manage your tasks, projects, notes and other critical information - point and click to add new items or reorganize existing data. Tasks can be viewed and sorted according to status, assigned person, priority and due date fields.